You’re ready for a new dining table and don’t know where to start. You know your taste but maybe not all the factors to consider? We can help you with that. How many people typically join you for dinner? Do you entertain often? The number of people that will will be seated is crucial for your table needs as you will want a table big enough to seat everyone comfortably. Some tables allow for removable space known as a table leaf. These pieces are great for accommodating more guests than you usually would and can easily be removed and stored for a later occasion. As a rule of thumb allow for 24″ between chairs for a proper and comfortable dining space. How big is your space? You will want to be sure that there is ample wall to furniture space, at least 24″, as well as room for diners to get in and out of their seats. If you’re working with a bigger space, a rectangle traditional or square shape will suit your needs. If you have a smaller space, round tables are most efficient, accommodating more while providing an inviting dining experience. – Square tables won’t work in a rectangle room due to dimensions. Two sides of the table will be closer to the walls making it more crowded for guests on those ends. – If you have children around, the corners of square or rectangle tables can pose as safety hazards. – Round tables, if supported by one center pedestal, can be a tipping hazard. Checkout the weight and distribution capacities along with giving it a good lean on one side for sturdiness. – The width of tables gets wider as it gets longer. Keep a width of at least 36″ for place settings and serving dishes. 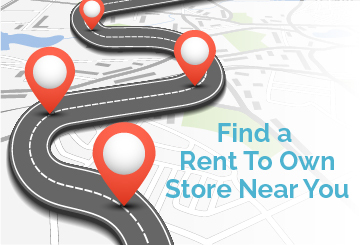 Happy table hunting and know that if you’re feeling uneasy about making a purchase, drop into your local rent to own store and try one out for size before you buy. Just another ShopRTO lifestyle and home decorating tip.